Have you ever felt that your surrounding environment just isn’t conducive to you? If you often find yourself in a busy and noisy place, you would probably know how annoying it is especially when you need to focus on doing your own thing. There’s nothing like having a good pair of noise-cancelling headphones to lock yourself away from the outside world so you may be left to do what you need in peace. These headphones will also keep your pesky colleagues or friends from talking to you every 5 seconds. Have your ambient noise significantly reduced with the MDR-ZX770BN. It digitally cancels the noise around you so that you can stay focused. Its Beat Response Control reduces heavy bass distortion in powerful punchy beats without compromising on music clarity. You can expect to enjoy absolutely clear mid to high notes with the high quality 40mm neodymium drivers in this pair of Bluetooth headphones. Although a fully charged battery will give you 13 hours of playback, in case your battery runs flat and you are unable to charge it in time, fret not because you can connect a cable and continue using it. It is a perfect pair of headphones to be used in a noisy work environment. Inbuilt with Google Assistant to make your life simpler, the Bose QuietComfort 35 II is more than just a pair of headphones. With this technology a touch away, you can make and receive calls, play music, quickly get answers to your questions. Just press the Action Button and start a conversation with your new assistant. Planning to spend the whole day out? No problem, because the QuietComfort 35 II lets you have 20 hours of playback and a quick 15-minute charge will boost it for another 2 hours. Be prepared for better bass and treat yourself with music like never before with this pair of headphones made with impact-resistant material. From the brand that makes some of the finest loudspeakers in the world, JBL is no stranger in the audio industry. The JBL T300A is a wired pair of lightweight, noise-cancelling headphones that give you signature JBL quality sound. Get extended frequency response and high sensitivity from its 40mm drivers. The T300A comes with an in-line microphone that allows you to make and receive calls, an adjustable padded headband and padded earcups to give you great comfort when you are listening to your favourite tunes. With this, you need not have to remember when to charge it again. Just use it and get the best that music has to offer. The Kingston HyperX Cloud II is a wired pair of headphones that comes with functions to make your gaming experience not only more enjoyable but also more effective. It has 53mm neodymium drivers that give you high-quality stereo sound while you’re immersed in the game. Take charge of the game with your new HyperX Cloud II for it has an adjustable microphone for you to communicate with team members and planning your strategies. Its closed cup design lets you enjoy passive noise-cancellation so you can happily sit alongside other noisy gamers - if you have to. Being DJ inspired, the SHL3060 wired headphones give out powerful stereo sound and bass. It is an ideal device to carry with you while travelling especially if you are on a budget. At the price of RM 89.00, it is about as cheap as good quality can get. Here, the 32mm high powered drivers give out detailed natural sound, while its closed-type acoustics provide great sound isolation, blocking away the ambient noise. Its ear-shells are adjustable and the headband it adaptive to fit the shape of your head firmly. The SHL3060 can easily be folded and brought around anywhere. Enjoy great ultra-high quality (UHQ) audio with the Samsung Level On while having the active noise-cancellation technology to keep the disturbance out of your ears. So rest assured knowing that this pair of over-the-ear headphones will give you a much richer and well balanced audio experience. Get the best out of your Level On with a touch control pad that has a variety of functions. Among them is the Activate Talk-In Mode which allows you to play, pause, increase and decrease volume, and skip tracks all by voice activation. 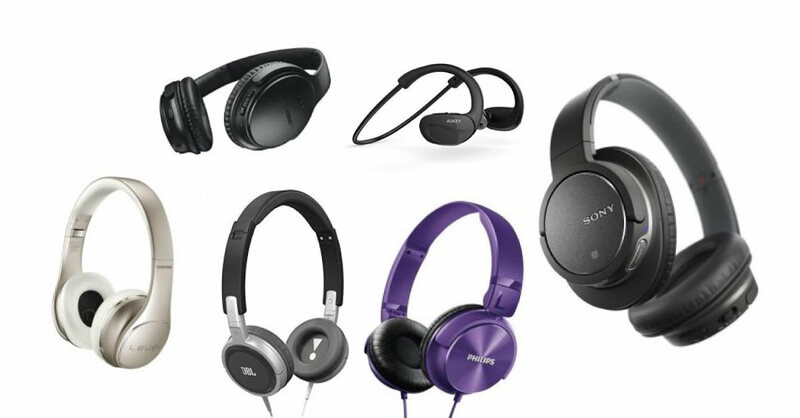 You can even pair your headphones with another to share your music! If the convenience of mobility and space saving is a priority to you, then you would want to consider getting the Sony MDR-EX750NA in-ear headphones. It comes with a dual noise sensor feature which allows you to simply click on the noise-cancelling function and it will access the ambient noise level to automatically choose the best setting for you – big features in a small package. This product comes with 9mm high sensitivity drivers that were designed to produce bright vibrant sounds. Its well-designed acoustic port gives out a tight and deep bass, ideal for low-end focused music styles. The Aukey EP-B34 is a headphone set that connects to your smartphone via Bluetooth technology. Its lightweight wrap-around design firmly holds on to the shape of your head while giving you the comfort you deserve. It has a standby time of 160 hours, and a playback of 8 hours. Coming with a microphone, multifunction button, and inbuilt volume control, the EP-B34 lets you manage your music and calls very easily. With CVC noise-cancelling technology, you can enjoy your music and take calls in a more conducive manner. This product also curls up for easy storage.